3NPS scales, as used by legions of guitarists but popularized mainly by Joe Satriani, are one of the most efficient ways to navigate the fretboard and get your scales down IF you follow the guidelines in this book. 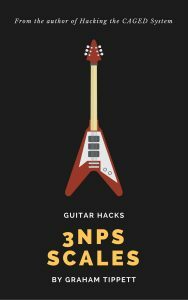 As the name suggests, a 3NPS scale is any scale that contains three notes on each string, and as you’ll see in this eBook, this makes for a very consistent way to map out scales on the guitar fretboard. What we’ve done here is revamped the 3NPS scale system and turned it into an incredibly effective means to learn a wide variety of scales all over the fretboard by streamlining the number of patterns, as well as the picking system. This is not a scale theory book, and contains no pentatonic scales. This is a quick and dirty (and very effective) method for learning 3NPS scales all over the fretboard; something to work on in the woodshed. It will improve your picking technique and speed. It does not require a great amount of thinking as you only need to learn two picking patterns, which is really one in two directions, and only three scale patterns instead of the usual seven per scale.